Leasing Available from $15.66 per month! Durable, all metal construction with large media window for easy viewing and monitoring of remaining supplies. Standard Stripper Sensor to sense printed labels in either strip-and-peel or tear-off applications. The thin film printhead provides high quality output, even with stepladder bar codes, in either 203 (H-426) or 300 (H-434) DPI. 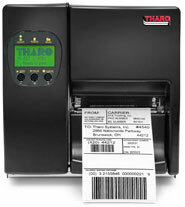 The THARO H-426 and H-434 printers are extremely versatile. No PC is necessary. Download your label formats to flash memory, unplug the printer, plug in a standard PC keyboard and take it to another location. A 450m ribbon capacity and a full 8 inch label roll capacity are suitable for large volume printing requirements. Standard Real-Time Clock for time and date stamping of labels. The thin film printhead provides high quality output, even with stepladder bar codes, in 203 DPI. 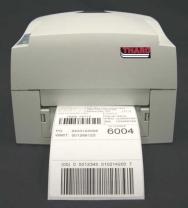 The THARO H-426 and H-434 printer options include a cutter (with catch tray), internal rewind, stand-alone keyboard and an additional 2MB of Flash memory. Each H and V-Series printer comes with an Accessory CD that contains documentation and all the software required to start printing labels. A free copy of the EASYLABEL Start labeling package. The H and V-Series feature a 3 month or 2 million linear inch warranty on their printheads. 12 month warranty on the H and V-Series printers. Media Label Roll: Max. 203mm (8) O.D. Label Roll: Max. 127mm (5) O.D. Resident Fonts 9 resident alphanumeric fonts (including OCR A & B) that are available in 4 orientations (0, 90, 180,270), 8-point sizes (6, 8, 10, 12, 14, 18, 24, 30), and are expandable 8 times horizontally and vertically. Downloadable Fonts Windows Bit-map fonts and Asian fonts are downloadable. Windows fonts in 4 orientations (0, 90, 180, 270). Asian fonts in 8 orientations.